A piece by artist-in-residence Erik Pearson. Photo by Bailey Cahlender. 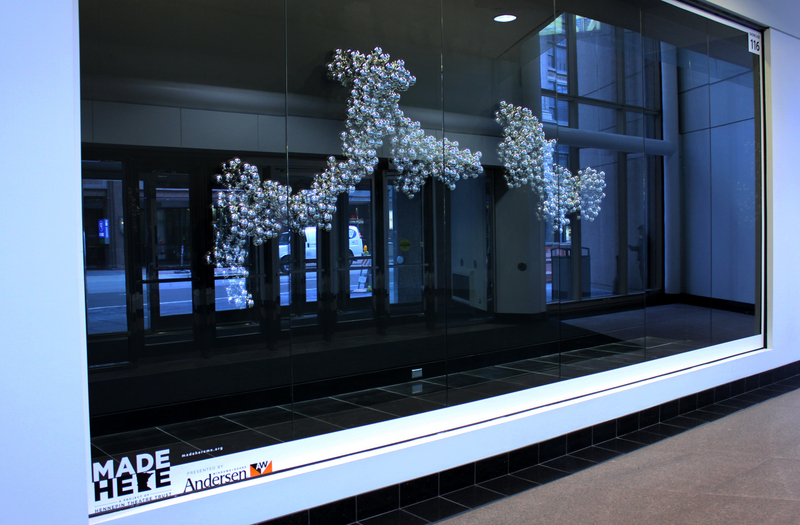 On Thursday, December 3, the Hennepin Theatre Trust launches Reflection: Made Here, the latest installment in the public art series presented by Andersen Windows. In the past year, downtown buildings have come and gone, a new hotel is rising on Hennepin, and the site of this year’s opening reception, Mayo Clinic Square, has been significantly transformed. The Twin Cities Arts Reader‘s Basil Considine sat down with Bailey Cahlander, a Program Associate with the Hennepin Theatre Trust, to discuss the project’s latest incarnation. How has the Reflection: Made Here showcase program evolved since it launched in 2013? What are plans for the showcase going forward? “Do You See What I See?” by Tim Carroll, one of the returning artists in the exhibition. Photo by Bailey Cahlender. How many people attended the guided tours in last year’s showcase? For each Made Here run we have a launch event celebrating the completion of all the showcases. For Reflection it’s on Thursday, Dec. 3, starting at Mayo Clinic Square from 5-9 p.m. Throughout this event, we hold tours, allowing hundreds of attendees to be the first to witness what’s been created around our current theme. For five months, pedestrian-traffic alone allows thousands of downtown visitors to admire what our local artists are capable of conceiving and creating! 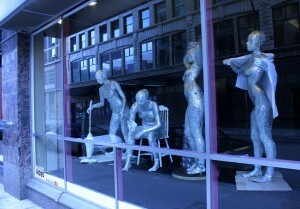 A set of statues by local sculptor Ruthie Krech. Photo by Bailey Cahlender. How many submissions were received for this installment, and how does this compare to previous years? Are there any returning artists? Reflection: Made Here received the largest amount of submission to date; we had 97 total proposals to consider! We have a few artists returning from previous rounds for Reflection: Made Here, including Tim Carroll, Christopher Selleck, Erin Lavelle & Anthony Chapin, Maggie Thompson, Tara Costello, our artist-in-residence Erik Pearson, and more! It’s a reaffirming sign to have artists continually apply for Made Here, and we find their proposals become stronger and sometimes more elaborate. What are some of the criteria used in evaluating the submissions? Are there any significant seasonal or topical variations? Quality: the work presented is of exemplary quality specifically in regards to the medium in which it is presented. Made Here does not require artist statements, resumes, or exhibition histories in order to apply. We curate ‘blind’, meaning that the panelists review the art without knowledge of artist names, in order to produce unbiased outcomes. Each Made Here run is inspired by a theme for artists to incorporate into their proposal. We’ve worked with ‘Brilliance!’, ‘Intersections’, and now ‘Reflection’. Throughout the winter runs we encourage the use of light, due to the nature of Minnesota winters! What are some pieces in this year’s showcase that speak to you personally, and why? ‘Reflection’ is a term that brings to mind a wide variety of meanings and interpretations. “Moments to the Ordinary” by Ruthie Krech is a striking visual representation of human forms, adorned with mirror and glitter, each frozen in positions of daily activities, like vacuuming and drinking coffee. 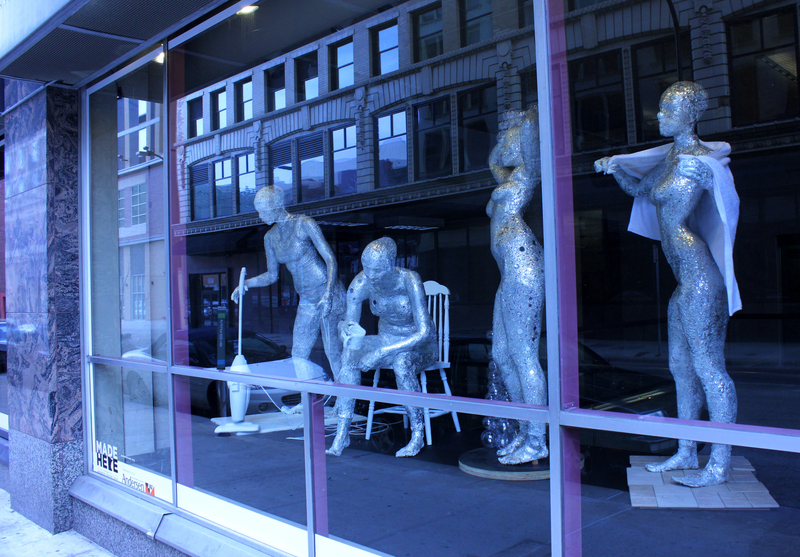 Seeing the forms posed in the showcase off Hennepin Avenue stops you in your tracks! Another showcase that is up-and-running was created by returning artist Tim Carroll. Tim fastened together hundreds of silver ornaments to create “Do You See What I See” in the City Center. The result is a hypnotizing collection of reflections and form, pausing viewers to reflect (see what we did there? ), literally! There are so many more amazing pieces coming together; it’s exciting to see showcases come to fruition from concept to reality!